Ames test it is a biological assay to assess the mutagenic potential of chemical compounds. It utilizes bacteria to test whether a given chemical can cause mutations in the DNA of the test organism. The test was developed by Bruce N. Ames in 1970s to determine if a chemical at hand is a mutagen. To determine the mutagenic activity of chemicals by observing whether they cause mutations in sample bacteria. Ames test uses several strains of bacteria (Salmonella, E.coli) that carry a particular mutation. Point mutations are made in the histidine (Salmonella typhimurium) or the tryptophan (Escherichia coli) operon, rendering the bacteria incapable of producing the corresponding amino acid. These mutations result in his- or trp- organisms that cannot grow unless histidine or tryptophan is supplied. But culturing His- Salmonella is in a media containing certain chemicals, causes mutation in histidine encoding gene, such that they regain the ability to synthesize histidine (His+). This is to say that when a mutagenic event occurs, base substitutions or frameshifts within the gene can cause a reversion to amino acid prototrophy. This is the reverse mutation. These reverted bacteria will then grow in histidine- or tryptophan-deficient media, respectively. A sample’s mutagenic potential is assessed by exposing amino acid-requiring organisms to varying concentrations of chemical and selecting for the reversion event. Media lacking the specific amino acid are used for this selection which allow only those cells that have undergone the reversion to histidine / tryptophan prototrophy to survive and grow. If the test sample causes this reversion, it is a mutagen. II) Prepare a test suspension of his-ve Salmonella Typhimurium in a plain buffer with test chemical (eg. 2-aminofluorene). Also add a small amount of histidine. Note: small amount of histidine is required so bacteria starts growing. 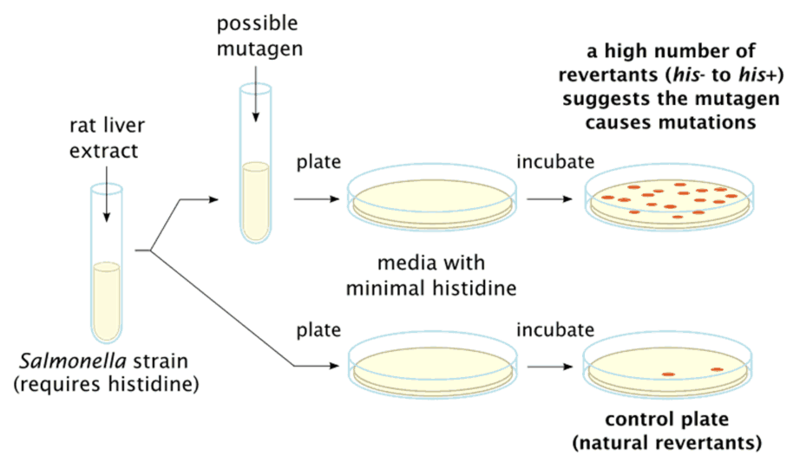 Once histidine is depleted only those bacteria mutated to gain the ability to synthesize histidine form colonies. III) Also prepare a control suspension of His-ve Salmonella Typhimurium but without test chemicals. V) Prepare the two agar plate and spread the suspension on agar plate. VI) Incubate the plates at 37°C for 48 hours. VII) After48 hours count the number of colonies in each plate. The mutagenicity of chemicals is proportional to number of colonies observed. If there is a large number of colonies on the test plate in comparison to control, then such chemical are said to be mutagens. Very few numbers of colonies can be seen on control plate also. This may be due to spontaneous point mutation on hisidine encoding gene. While Ames test is used to identify the revert mutations which are present in strains, it can also be used to detect the mutagenicity of environmental samples such as drugs, dyes, reagents, cosmetics, waste water, pesticides and other substances which are easily solubilized in a liquid suspension. Simple, rapid and robust bacterial assay. Ease and low cost of the test make it invaluable for screening substances in our environment for possible carcinogenicity. Ames test can detects suitable mutants in large population of bacteria with high sensitivity. Ames assay consists of Salmonella typhimurium strains and so it is not a perfect model for human.